forth in the witness of John Bosco, that we may give ourselves completely to thy service and to the salvation of all; through thy Son Jesus Christ, who liveth and reigneth with thee and the Holy Spirit, one God, for ever and ever. Amen. Loving God, who tenderly cares for children and orphans: Fill us with love like that shown forth in the witness of John Bosco, that we may give ourselves completely to your service and to the salvation of all; through your Son Jesus Christ, who lives and reigns with you and the Holy Spirit, one God, for ever and ever. Amen. John Bosco (16 August 1815 — 31 January 1888), born Giovanni Melchiorre Bosco, also called Don Bosco, was an Italian Catholic priest and educator, who put into practice the dogma of his religion, employing teaching methods based on love rather than punishment. He placed his works under the protection of Francis de Sales, thus his followers styled themselves the Salesian Society. 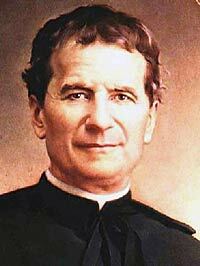 Don Bosco succeeded in establishing a network of centers to carry on his work. In recognition of his work with disadvantaged youth, he was canonized by Pope Pius XI in 1934.